Natural gas caters for approximately one-fifth of the world’s total energy requirements. Food and beverage, pulp and paper, metals, chemicals, petroleum refining, glass, plastics and power generation industries account for nearly 40% of total consumption. The recent discoveries of natural gas in Southern Africa, which includes trillions of cubic metres discovered in the Rovuma Basin off the Mozambique coast, have marked one of the most active periods for numerous energy reliant industries. The newly available gas is expected to spark an increase in Natural Gas usage, marking a new dawn for the Southern African energy landscape. The increase in the availability of Natural Gas presents an opportunity for many industries to significantly increase profitability while reducing energy costs. In its effectiveness, Natural Gas provides a consistently high energy heat of +/- 39.22 MJ (10.89 kWh) per m3, this is an economically friendlier option than most fossil based fuels. Natural Gas burns cleaner than most fossil fuels reducing stench; it improves equipment and plant performance and reduces maintenance by minimising the build-up of carbon residues within components, which reduces down time. 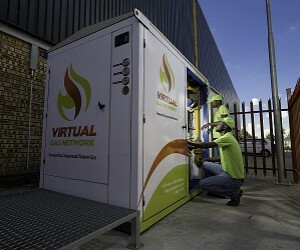 Johannesburg, South Africa, is one of the first areas to benefit from the newly accessible Natural Gas network. This is being made possible through the development of a rapidly expanding gas distribution network by Virtual Gas Network a division of CNG Holdings. This is a road distribution method on a commercial-scale suppling natural gas in South Africa. 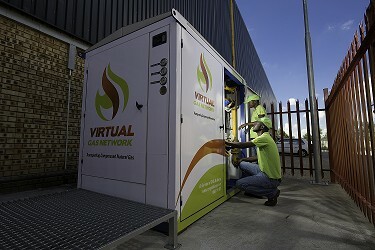 The network is available to businesses anywhere within a 300-km radius of Johannesburg and will soon be launched in KZN. Natural Gas is also an environmentally friendlier energy alternative, it emits lower levels of harmful emissions such as carbon monoxide, carbon dioxide, and nitrous oxides. It produces fewer greenhouse gases when compared to other fossil fuels. Due to that reason, the Virtual Gas Network (VGN) was enlisted to convert the coal-burning boiler systems of 10 state-owned hospitals to cleaner natural gas. This move is part of the government’s Green Initiative which encourages healthier energy alternatives. Recognising the importance of reducing carbon emissions and foreseeing the benefits that a low carbon economy can bring, the South African government has committed to greenhouse gas emissions reductions of 34% by 2020 and 42% by 2025 through the introduction of the Carbon Tax Bill. Natural gas will play a critical role in assisting companies to adequately revise their energy models in light of this Bill. Natural gas, which emits up to 27% less CO2 and other GHG’s than other fossil fuels, will play a critical role in allowing companies to maintain their production targets under a cleaner, healthier and effective energy dispensation. VGN has already converted canneries, hospitals, manufacturing and assembly plants across a range of industries, as well as taxi’s, petrol and diesel fleets and warehouse forklifts in various storage and logistical applications to Natural Gas.